The RV's interior is in good condition. It has been serviced and winterized. The decal edges are a little frayed. The owner is going to repair them. All of the mechanics are working and in good condition according to the owner. 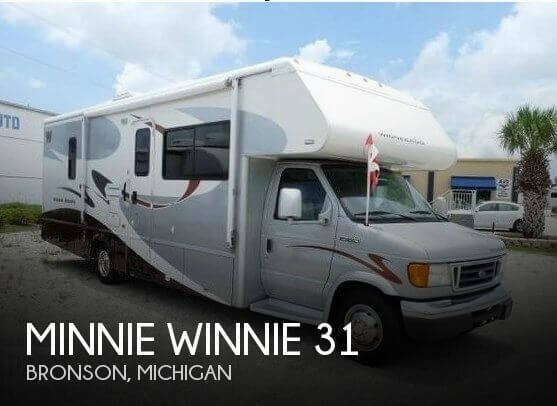 Stock #155838 Renowned Winnebago quality coach easily maneuverable, she comes fully equipped and has almost new tires and an entertainment center over the cab!! If you are in the market for a class c, look no further than this 2006 Winnebago 31C2, priced right at $38,900. This Class C is located in Bronson, Michigan and is in great condition. She is also equipped with a Ford engine that has 56,000 miles. Reason for selling is no time.